The Holy Cross Tigers became the second Louisiana school to win the South Walton Border Wars, held on December 2nd and 3rd at South Walton High School in Santa Rosa Beach, Florida. Brusly won the inaugural Border Wars tournament in 2013. Holy Cross had four finalists and each one walked off the mat victorious. The winning Tigers were Jake Rando at 152 lbs., Joey Foret at 170 lbs., Michael Benton at 182 lbs. and Spencer Rayes at 195 lbs. Division I state champion Cole Clement placed third for the Tigers. Clement fell in the semifinals to Flagner's Eric Holder, but so did everyone else who competed against Holder, including Arnold's William Pickren in the finals. Jacob Spahn finished fourth at 120 lbs., as did Brady Butler at 145 lbs. Placing fifth for the Tigers were Caruso Signorelli at 106 lbs., Michael Lundin at 113 lbs. and Randel Amos at 285 lbs. Foret was named the Outstanding Wrestler in the heavier weight classes. 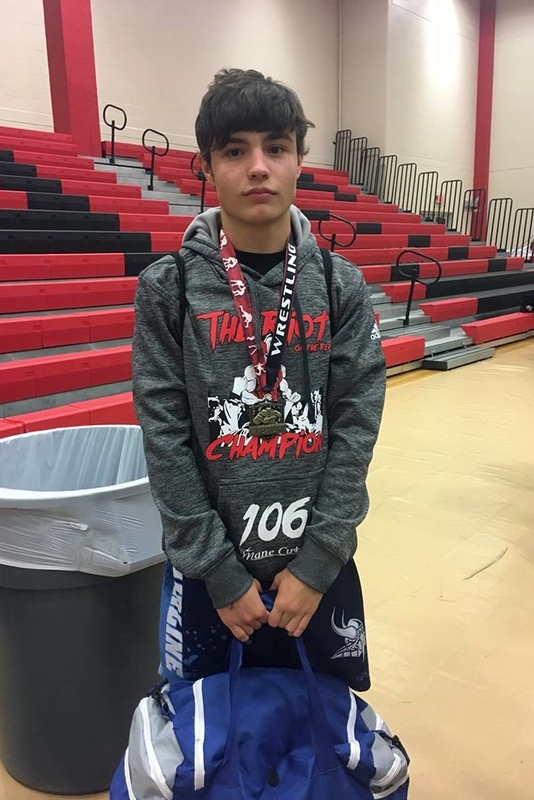 Thompson's Sam Latona was the OW in the lighter weight classes. In a rather unexpected, yet not atypical, comeback, Jesuit, which was in fifth place after Friday's pool rounds, jumped over teams from Flagner, Florida, Thompson, Alabama and Arnold, Florida, to place second. 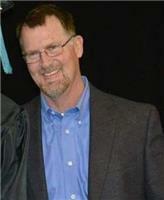 The Blue Jays had three finalists, two of which were defeated in the finals by fellow Louisianans. Eli Larriviere won the 145 lbs. weight class, but Adam Larriviere lost to Shane Ulfers of St. Paul's while Brandon Greer lost to Foret in the finals. Sam Dreuil placed third at 106 lbs., as did Paul Treuting at 182 lbs. and Thomas Arseneaux at 195 lbs. Placing fifth were Luke Eccles at 120 lbs., William Rosevally at 160 lbs. and Perry Ganci at 220 lbs. St. Paul's placed seventh and had a champion in Shane Ulfers at 138 lbs., who defeated Jesuit's Adam Larriviere in the finals. Brandon Stein finished third at 113 lbs., as did Division I state champion Cole Houser finished fourth, losing to Columbia's Chace Curtis via a takedown in the last five seconds of the consolation finals match. Fifth-place honors went to Jared Thieler at 132 lbs. Rummel, which only brought eight wrestlers, had two runners-up. 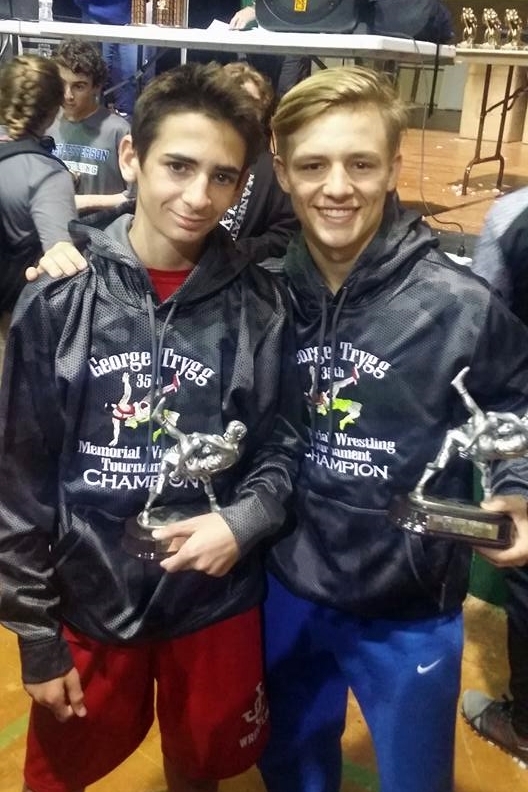 Chris Montalbano, at 106 lbs., fell in the finals to Latona while Blake Mateu, who placed first in the 2014 Border Wars, lost in the 120 lbs. finals. Thom Harrison Courage Award winner Joseph Pearson, with South Walton coaches Nick Cary and Darrin Dunwald, and members of the Harrison family. Harrison (photo right), who succumbed to cancer on November 18th, ran the first three Border Wars tournaments and formerly coached at Fort Walton Beach High School. St. Paul's defensive back Michael Doherty suffered a serious back injury on November 14th in a playoff game with Shaw. 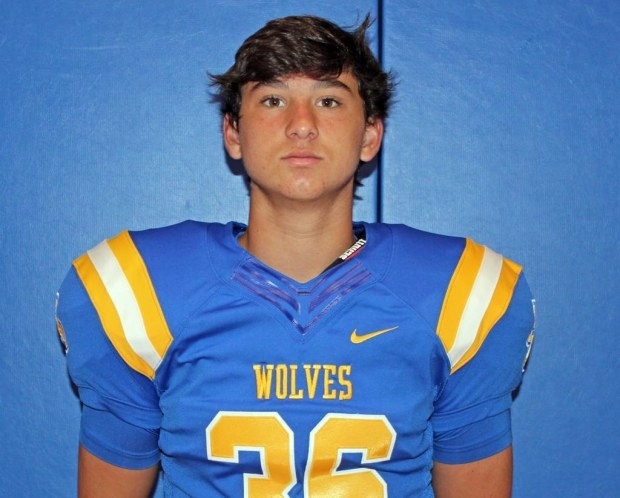 In a very nice gesture, Coach Nick Cary donated the proceeds from two raffle events to help aid in the recovery of St. Paul's Michel Doherty, a defensive back, who was severely injured in a football playoff game on November 11th, 2016 versus Shaw. 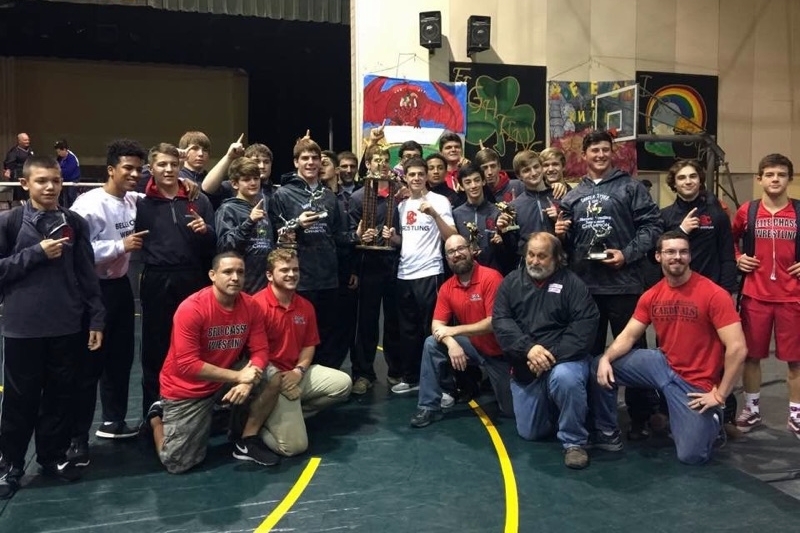 The Belle Chasse Cardinals fought off a stubborn De la Salle squad to win the George Trygg Memorial Tournament at Grace King High School on Friday and Saturday. Belle Chasse amassed 192 points to edge the Cavaliers by 9.5 points. Brother Martin, John Curtis and John Ehret round out the top five teams. Belle Chasse had three champions: Bryson Falcon at 126 lbs., Zack Edwards at 182 lbs. and Brett Dingler at 220 lbs. Cavaliers titles were won by Jeffrey Hefner at 120 lbs., Conrad Wyre at 152 lbs., Raekwon Thomas at 160 lbs. and Alex Ormond at 195 lbs. John Ehret matched Belle Chasse's three champions with three of their own. Gage Sonnier at 113 lbs., Joshua Bell at 138 lbs. and Remy Toups at 285 lbs. each won championships for the Patriots. Vincent Rizzo of Brother Martin won at 145 lbs. and Troy Bourgeois of Fisher won at 170 lbs. The River Ridge Patriots of John Curtis had champions in Colten Kendrick at 106 lbs. and Brendon Wilcox at 132 lbs. (photo right). 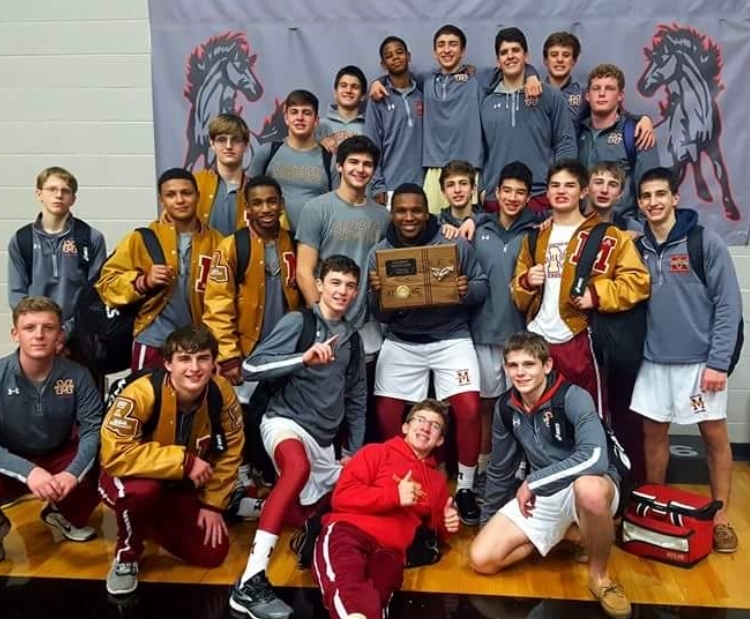 Comeaux wrestlers won nine championships at the Ronnie Suarez District 3-5A Championships, held at Sulphur High School last Saturday, winning the event by 58.5 points over runner-up Barbe. Barbe had two champions while Acadiana, Sulphur and Lafayette garnered one title apiece. and Dylan Ames Raven Guidry with 160 lbs. 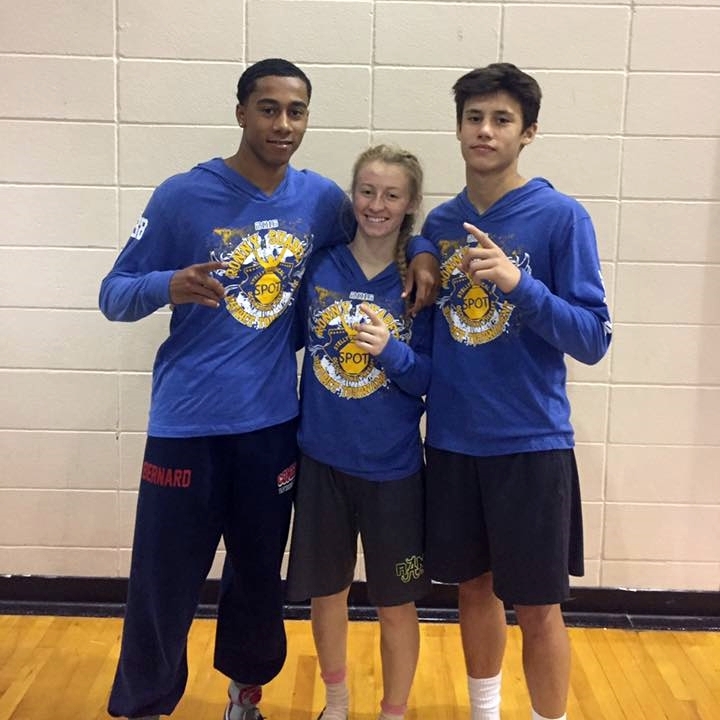 At the Riot on the Red tournament, held last Saturday at Parkway High School, host Parkway proved the importance of placing well in weight classes they do not win. 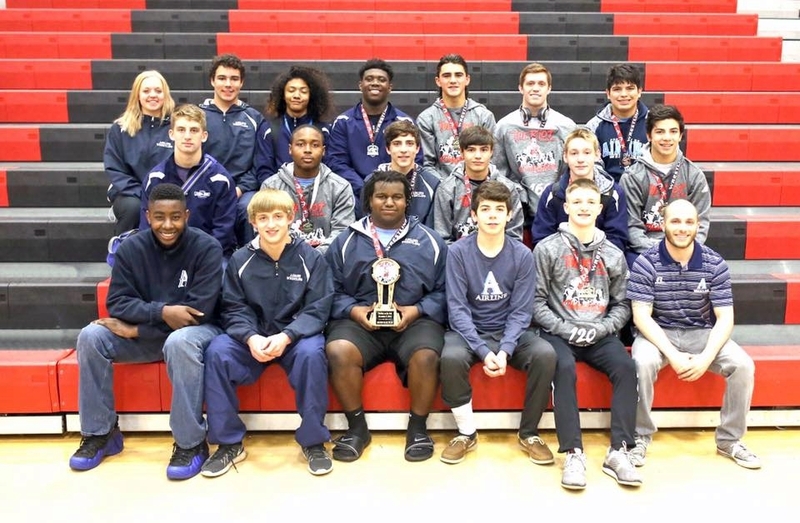 Airline had six champions to Parkway's four, but the Panthers had one more finalist and two more third-place finishers than the Vikings. That difference was enough to earn Parkway the team championship by 24 points over the runner-up Vikings. North Desoto had two champions and placed third. The end of the tournament was ruled by Lakeside, though, which won titles at 220 lbs. and 285 lbs. Airline should play a major part in what may be the closest Division I state championships in years. Hence, Division II contenders Live Oak, Teurlings Catholic and Rummel should not dismiss the Panthers come February in Bossier City. Behind championship performances by Luke Cotton at 120 lbs. and Patrick Evans at 138 lbs., and runner-up places by Daniel Varnado at 106 lbs., Lane Boudreaux at 126 lbs. 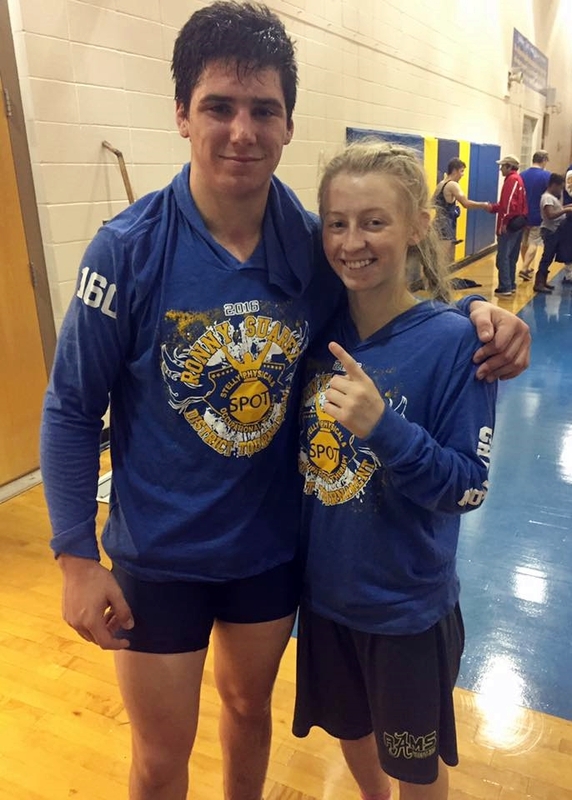 and Nathaniel Perdue at 182 lbs., Brother Martin won the Stewart Schay Blackhorse Invitational at Houston High School in Germantown, Tennessee, last weekend. The Crusaders scored 238 points, which was 26.5 points better than Christian Brothers High School of Memphis, Tennessee. This was Brother Martin's third consecutive Blackhorse victory. "Today, Saturday, December 3rd, St. Amant Wrestling accomplished something I wasn't sure we'd do anytime soon! I've always known these young scrapers could win, but they won the Catholic Duals in the strangest way! We won 3 and lost 1, but the way the other teams faired put us in the finals vs. Hoover, AL, who last year beat us 36-30. We started with a win over a tough Brusly team who then went on to tie Live Oak but won due to criteria. Our second win was against East Ascension, who has been very generous in allowing us to practice in their facilities while we've been homeless. After that, EA handed Live Oak their 2nd loss. Our 3rd match was vs. a Live Oak team whom matched up with us very well and handed us our 2nd loss of the season. Fortunately for us, since Brusly and EA both beat Live Oak and we beat both EA and Brusly, this put us in the finals vs. Hoover, who earlier tied Catholic but won due to criteria. This allowed us to hand Hoover their first loss of the tournament, 47-29, in the finals. I appreciate that this team didn't give up after an unexpected loss to Live Oak. This is the first time that St. Amant has won the Catholic Duals in the many years of participating!" 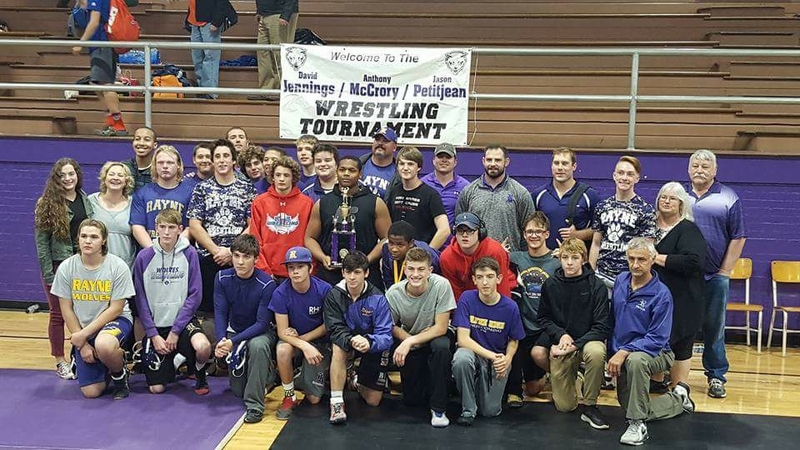 Rayne was victorious at the Jennings, McCrory, Petit Jean tournament, held at Rayne High School last Saturday. 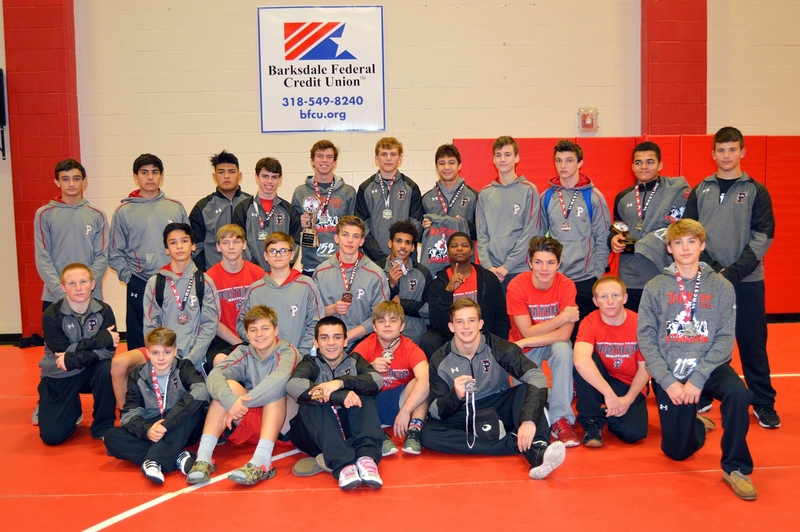 Ouachita Christian Academy brought six wrestlers to the Northwest High Invite held on Saturday, December 3rd, in Justin Texas. With just those six, they still placed second as a team, a mere nine points behind champions Fort Worth Carter-Riverside. Sam Pitts and Mathew Matherne won individual championships. Michael Webre and Connor Costello placed second while Mikey Gordy placed third and Cole Ringle fourth.